WEST LAFAYETTE, Ind. — Advancing research and education to reduce the devastation and loss of human life from earthquakes and tsunamis is the goal of a new center at Purdue University. The National Science Foundation awarded $105 million to a Purdue-led team to spearhead a center that will serve as headquarters for the operations of the George E. Brown, Jr. Network for Earthquake Engineering Simulation, or NEES. Submitted through the Cyber Center in Purdue’s Discovery Park, the grant spans five years and is the largest in the university’s history. Purdue will connect 14 NEES research equipment sites and the earthquake engineering community through groundbreaking cyberinfrastructure, education and outreach efforts. Purdue’s center is expected to begin operations on Oct. 1, and will be housed in the university’s Discovery Learning Research Center in Discovery Park. “I was delighted to learn that Purdue has the opportunity to lead this consortium of first-rate research universities,” said Purdue President France A. Córdova, who serves on the National Science Board, the governing board for the NSF, but was excused from deliberations on the award. “I’ve seen firsthand how devastating an earthquake can be not only to buildings, highways and the infrastructure of a city, but also to families, the community and people’s sense of security. In the past decade, 124 major earthquakes have occurred throughout the world, according to the U.S. Geological Survey. Major earthquakes are generally accepted to register a magnitude in excess of 7 on the Richter scale and inflict serious damage, including the collapse of buildings and bridges, over a large area. The organization estimates that earthquakes were responsible for 463,959 deaths in the past decade. The Purdue-led NEEScomm Center, which stands for NEES Community and Communications, includes partners from the University of Washington at Seattle, University of Texas at Austin, University of Kansas at Lawrence, San Jose State University, the University of Florida at Gainsville, University of Michigan at Ann Arbor and Fermi National Accelerator Laboratory. The center will help researchers share information and equipment to enable research and innovation in earthquake and tsunami loss reduction, create an educated work force in hazard mitigation, and conduct broader outreach and lifelong learning activities, said Julio Ramirez, the project’s principal investigator and a professor of civil engineering. Building codes and earthquake preparedness have improved in recent years, but even cities that lead in incorporating the latest safety features are at risk for serious damage, he said. Older cities and those in developing countries are likely to have the most buildings vulnerable to earthquakes and face the highest risk for damage and loss of lives, he said. Forbes magazine cited a 2001 study by GeoHazards International that estimated the number of lives that would be lost if different cities experienced a magnitude 6 or higher earthquake. The study evaluated cities in Asia and the Americas. Kathmandu, Nepal, topped the list, followed by Istanbul, Turkey; Delhi, India; Quito, Ecuador; Manila, Philippines; and Islambad, Pakistan. All of the cities were estimated to face tens of thousands of fatalities if an earthquake struck. The Purdue-based center will lead, manage, operate and maintain NEES. Through the NEES network, researchers from the United States and abroad conduct experiments and simulations of the ways buildings, bridges, utility systems and different materials perform during seismic events. Earthquake engineers will use this information to develop better and more cost-effective ways of reducing earthquake damage through improved materials, construction techniques and monitoring tools, Ramirez said. The center’s education, outreach and training initiatives will use engineering education research to construct next-generation learning experiences that can be disseminated globally, he said. A team of engineering educators and technology specialists will develop the NEES Academy, a state-of-the-art virtual institution for cyber-enabled learning. The academy will help preK-12 teachers develop student interest in, and awareness of, science, mathematics, engineering and technology and will support undergraduate and graduate students engaging in research. Joy M. Pauschke, NEES program director at the National Science Foundation, said NEES is an integral part of the U.S. National Earthquake Hazards Reduction Program to support basic research to discover new knowledge, innovation and technologies for earthquake and tsunami loss reduction for the nation. 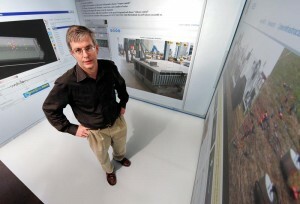 A cornerstone of the center is the development of information technology components that allow for new forms of collaboration and cooperation, said Rudolf Eigenmann, co-principal investigator and professor of electrical and computer engineering. The NEEScomm Center will be a collaborative space and science hub where scientists and engineers can run scientific models and “what if?” scenarios. 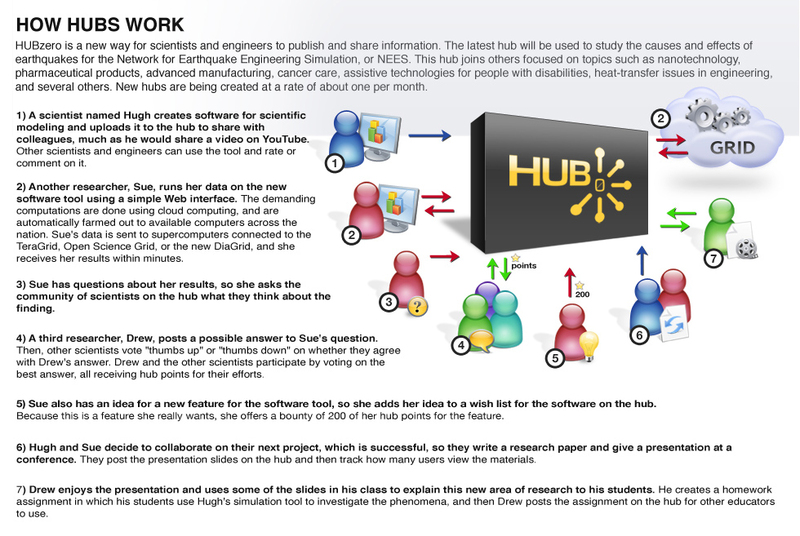 Hubs, which were first developed at Purdue, allow researchers to run models using a simple Web interface. The hub connects with supercomputing resources on the NSF’s TeraGrid and the national DiaGrid, which allow researchers to run their experiments without having to request time on a supercomputer. 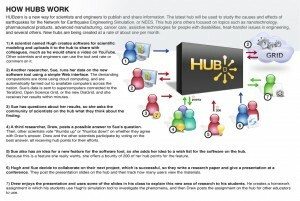 The cyberinfrastructure to be deployed by the NEEScomm Center is powered using HUBzero technology, which was originally created by researchers at Purdue University to support nanoHUB.org, a site for researchers studying nanotechnology. Currently there are nine other hubs online in science, engineering and medicine, and 12 more are expected to be online within a year, including the new NEEShub. Ellen Rathje, professor of geotechnical engineering at the University of Texas at Austin and co-principal investigator of the project, said another key advantage of NEEShub is its data presentation capabilities. In addition to Ramirez and Eigenmann, Purdue University project co-principal investigators include Thomas Hacker, assistant professor of computer and information technology; Sean Brophy, assistant professor of engineering education; and Saurabh Bagchi, associate professor of electrical and computer engineering. In addition, assistant professors of civil engineering Santiago Pujol and Ayhan Irfanoglu provide the team with earthquake engineering expertise in information technology matters of tele-operation and data management. Project co-principal investigator Barbara Fossum, former managing director of Purdue’s Cyber Center, will serve as the center’s deputy director, and Dawn Weisman, former managing director of Purdue’s PRISM: National Nuclear Security Administration Center for Prediction of Reliability, Integrity and Survivability of Microsystems, will serve as information technology director. Co-principal investigators Brophy and Thalia Anagnos from San Jose State University will co-lead the center’s education, outreach and training initiatives. Fossum said the center will manage the operations of the network and engage the equipment sites to effectively carry out program initiatives. The center will create more than 20 full-time positions and five graduate student positions at Purdue for Web application developers, software engineers, and research scientists and engineers. The NEES equipment sites include Oregon State University; University of Nevada, Reno; University of California, Davis; University of California, Berkeley; University of California, Santa Barbara; University of California at Los Angeles; University of California at San Diego; University of Texas, Austin; University of Minnesota; University of Illinois, Urbana; University at Buffalo-SUNY; Cornell University; Rensselaer Polytechnic Institute; and Lehigh University. NEES began development in 2000 and is a shared national network of 14 state-of-the-art earthquake engineering and tsunami experimental facilities at universities across the United States. It includes collaborative tools, a centralized data repository and earthquake simulation software.